REMEMBER: A time when simple pleasures made you happy. RELAX: With those who are closest to you. 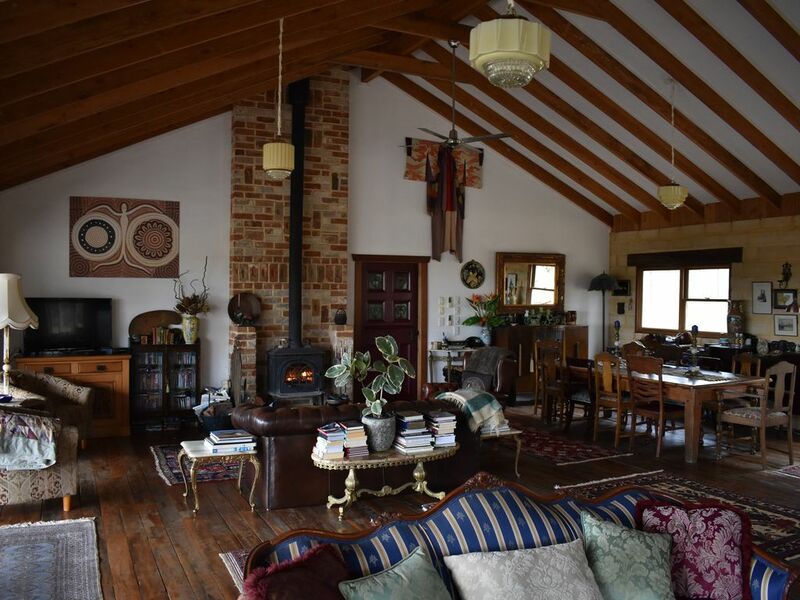 Enjoy the rustic luxury of our three bedroom, two bathroom rural retreat set on five acres in the Portland Town Common with stunning views of the Great Dividing Range. Although secluded - set within the boundaries of 100 acre properties - it is only a five minute drive to the quaint local shops featuring old advertising signs, the original Art Deco Crystal Theatre and olympic swimming pool. Featured in The Sun-Herald travel section and Blue Mountains Life magazine, the house was built using recycled materials such as old convict bricks, chunky bridge timbers, floorboards rescued from the old Bathurst Hat Factory and leadlight windows and doors. There's an expansive open-plan living area with cathedral ceilings and ten bi-fold doors which open onto a large deck area. The main bathroom features an enormous shower and there is a deep claw-foot bath in the ensuite. Full laundry and kitchen facilities are offered as well as a slow combustion wood heater and electric blankets, fluffy quilts and quality cotton sheets. We have an interesting collection of memorabilia and antiques, sourced over the years, and a good selection of DVD's, books and games. The property is home to our two alpacas and your pets are welcome. There are yabbies in the local creek, which is a five minute walk from the property. The area boasts many species of native birds and wildlife, as well as the Town Common ponies, who roam around by the creek. Experience the magnificent night sky! Ideal for small, intimate weddings and ceremonies, without breaking the bank. There are easy day trips to Cowra, Orange, Mudgee, Hill End, Sofala, and scenic short drives to the stunning Capertee and Wolgan Valleys, Lithgow, Bathurst, Oberon and the Jenolan Caves. Please note Mountain View Escape is owned and managed entirely in Australia and we will never ask for money to be transferred to an overseas bank account. We build the house using mostly recycled materials such as early convict bricks, rustic and chunky old bridge timbers, old cattle yard and old hat factory materials. It is unique and secluded - with most visitors being the local kangaroos, wombat and local horses. The feeling of "escaping" from city life and stresses and being able to actually "see" the amazing night sky and milky way in all it's celestial glory is unforgattable. There is mobile reception at the property and also a landline. All bedrooms have electric blankets and column heaters. Main living room has wood slow combustion fireplace. There is gas heating on the veranda and a fire pit on the property. All wood is supplied for indoor fireplace and fire pit outside. Basic pantry items such as coffee/tea/sugar, sauces, foil and plastic wrap are supplied. Large kitchen area with electric stove top, oven, microwave, double refrigerator. All utensils, crockery, pots and pans supplied. Large dining table which seats ten as well as large outdoor dining tables. There is TV in the main lounge area with Cable TV connected. There is also a small TV in the end bedroom. Yes, in the main loungeroom. We have a quality stereo and a good selection of CD's. Yes, DVD players in both lounge room and end bedroom. We offer an large and eclectic selection of reading material. There is a good selection of games to suit groups and families/couples. We have a large range of CD's to suit all tastes. There are two toy boxes to keep the little ones amused. We have an extensive selection of DVD's to suit most tastes and interests. The property is situated on seven acres and includes a dam filled with yabbies. Two large deck areas to accommodate large groups. The local golf course - just a few minutes drive away - offers a unique "sand green". Mountain View Escape is ideal for both family and small group gatherings as well as romantic escapes. We are situated just a half hour drive from the majestic Blue Mountains and the stunning Capertee Valley. It is an easy drive to the wineries of Mudgee or the beautiful Bathurst and Orange regions. Sorry, I am late for doing this. It's a wonderful place to stay, more like a dream house. We had two prefect days in house, everything is clean and neat. When the sunlight came in the house, it felt like I was in the wonderland. Also, we saw different kinds of animals, especially the fox. I will wishing the people who live in there have amazing days. Beautiful house lots of character. Amazing! We spent awesome two days at mountain view escape even though the weather wasn't that good. Definitely will be back. Second time staying here. Amazing host and best location. Beautiful everything. Mountain View Escape is a fantastic getaway! A great city escape. You'll enjoy the ample lounging areas. Would highly recommend to others. The six of us really enjoyed our 2 night stay here. It was a very unique experience and loved being able to bring our puppy along for the fun. The house is very clean, well decorated and looks out over a beautiful landscape. We woke up to alpacas and kangaroos in the front lawn both mornings. We greatly enjoyed just lounging on the great deck. It's quite a hike from the Blue Mountain tourist spots but you can hit those on the drive out there or the return trip. Highly recommended.